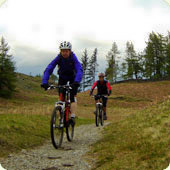 Black Crag, Knipe Fold, Skelwith Bridge - Cumbrian Trail Guides - Mountain Bike Cumbria - beautiful trails and information from throughout the Lake District and beyond! This is only a link trail but is fun, that is why I have mentioned it on here! If you are in this area then this makes for a great addition to any route! Off-road, Single Track in places, with some technical bits! Find Knipe Fold on a map or use Streetmap.co.uk. Once you have gone up the trail for 3/4 km, there will be a gate on the RIGHT, which goes into a wooded area. When you are though the woods there is another gate, you can now ride 1 3/4 km of single track, until you get to the A593. All you have to do is turn right, which takes you down a nice fast hill, to Skelwith Bridge. This trail has been viewed 49612 times!